I made this call of duty cake for my son’s 21st. birthday because he loves playing call of duty the video game. When I made the cake I had no idea what I was going to do . But I knew I wanted to make a call of duty cake and had no idea what the game was even about but knew that he loved playing the game. Making this cake for him turned out to be a lot of fun though. I have only been making my own cakes for about two years. After I made the cake and assembled it, I then gave it to my son. He was very surprised with it. And loved it! And before we could even cut in to it he had to post pictures on his Facebook page for everyone to see. His friends couldn’t believe that I made his cake. The hardest part of the cake was coming up with the figures for the cake and assembling the whole idea on the cake. The easy part was taking it apart and eating it! Birthday cake idea Posted by TRACIE D.
This is amazing! Where did you get the figures?! My son would like one for his bday, and this was the best idea I’ve seen so far! 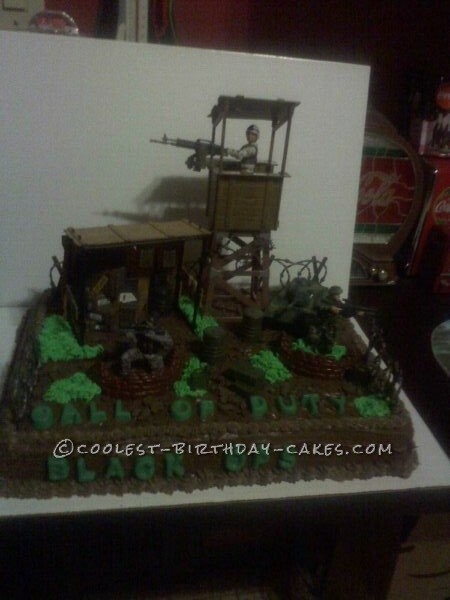 This would be perfect to top the epic minecraft cake I made last year!